Fast ELISA kit now available: Boster is proud to announce the newest Picokine Fast ELISA kits. Now you can perform what used to be 4+ hour ELISA assay in under 1.5 hours. 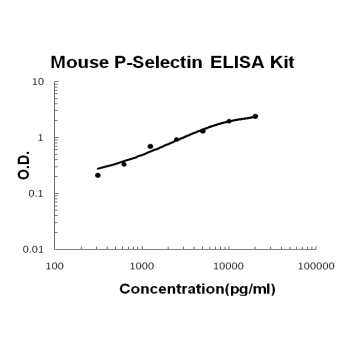 Available for Mouse P-Selectin / CD62P PicoKine™ Fast ELISA Kit and many others. Sandwich High Sensitivity ELISA kit for Quantitative Detection of Mouse P-Selectin. 96wells/kit, with removable strips. Stored in the alpha-granules of platelets and Weibel-Palade bodies of endothelial cells. Upon cell activation by agonists, P-selectin is transported rapidly to the cell surface. Ca(2+)-dependent receptor for myeloid cells that binds to carbohydrates on neutrophils and monocytes. Mediates the interaction of activated endothelial cells or platelets with leukocytes. The ligand recognized is sialyl-Lewis X. Mediates rapid rolling of leukocyte rolling over vascular surfaces during the initial steps in inflammation through interaction with PSGL1. .
P-selectin, also called GMP-140, CD62, or selectin P, is a 140-kD adhesion molecule, expressed at the surface of activated cells, that mediates the interaction of activated endothelial cells or platelets with leukocytes. It is stored in secretory granules and expressed at the plasma membrane after cell activation. It is known to play an important role in atherosclerosis. The major ligand for P-selectin on leukocytes is P-selectin glycoprotein ligand-1(PSGL-1). The standard product used in this kit is recombinant mouse P-Selectin, excluding intercellular P-Selectin and transmembrane domain. It has 42-709 amino acids sequence with the molecular mass of 99.1KDa. As a result of glycosylation, the molecular mass of 190-200KDa is revealed by SDS-PAGE.